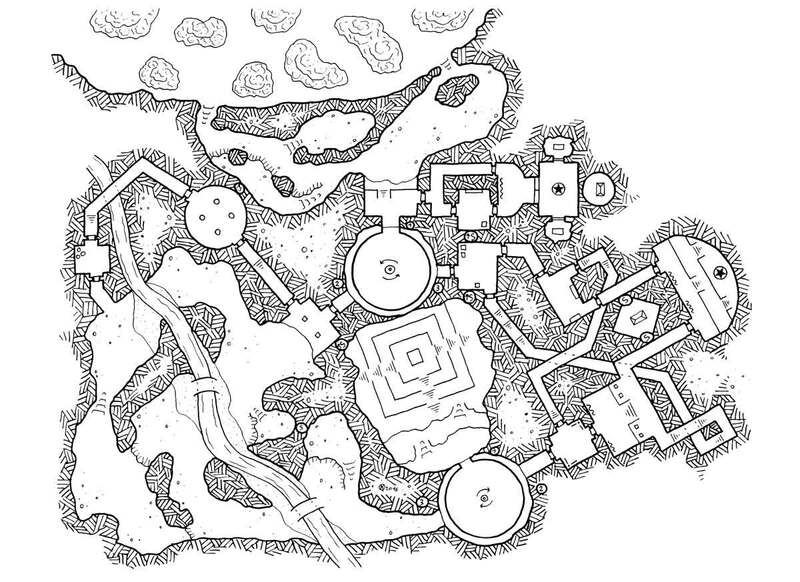 The clever Dwarf King Dwalok had a complex dungeon designed by his architects to hide the wealth of his clan. At first, the fortress looks like a simple dwarf tomb with a strange circular room. Dwalok asked his best inventor to create a mechanism that only his hammer could activate. By inserting the heavy hammer carved in the central pedestal, the mechanism caused the room to rotate. To make the place more secure, the inventor expressed his talents by creating a second rotating room, and the mechanism rotated the two rooms at the same time, but in reverse! The king, accompanied by his loyal brothers in arms, were required to have perfect timing and perfect knowledge of the vault and its secret passages to make it to the treasure room. In fact, the path was full of pitfalls: one side the cave was infested with troglodytes, and on the other side, corridors twist and halls intermingled at confusing angles. After his death, King Dwalok was buried in a secret room within the small maze. His hammer was proudly worn by his comrades, and then hidden by the last survivor. Today, the king lies in his grave, nobody has yet managed to enter the tomb or stolen his hoard of wealth.